Changes to paid search favor OEMs and larger websites. Dealers will be forced to adjust. Digital advertising continues to ascend, with spending expected to surpass broadcast by 2017 – that’s just next year. Paid search remains a go-to channel. But Google’s recent AdWords changes have many advertisers discovering they’re spending more money for worse results. In the automotive marketing world, these changes mean that individual dealerships are actually bidding against OEMs for the same keywords. As a result, they’re cannibalizing themselves, while driving up prices at the same time. It’s a study in waste and inefficiency. In a recent report from business intelligence firm L2, the numbers tell the full story. For a full two-thirds of major automotive brands, OEM sites and dealer networks are competing against each other for that brand’s search terms. 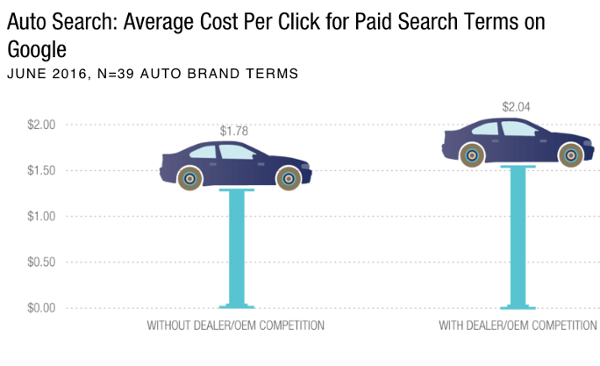 And of those, 85% of paid search results had more dealer-focused results than OEM site results, suggesting that dealers’ budgets were suffering the greatest damage from the inefficiency. It’s an issue dealers and OEMs need to work together to solve. But in the meantime, dealers can mitigate the impact of this less-than-ideal situation by developing a precise strategy that minimizes waste. Understanding which channels are effective, and which aren’t, and ensuring you’re putting your budget where it can have the most impact, begins with accurate data and impartial analysis. Tools like the LotLinx VIN View Optimizer™ are a great way to develop a precise understanding of the impact of every dollar you spend. So you can boost results, while making the most of every dollar spent.